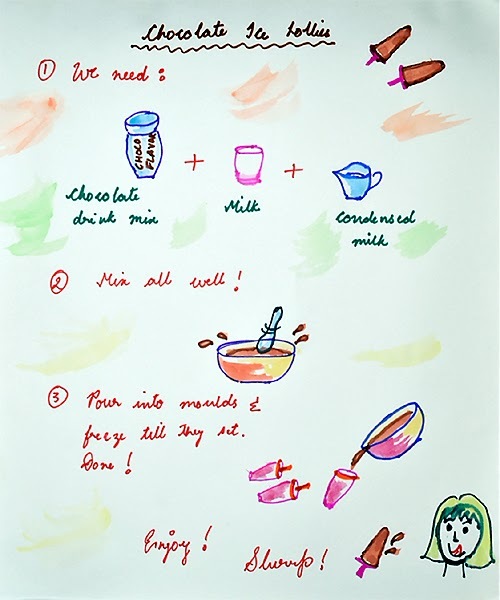 Chocolate Ice Lollies - the Doodle way! I used to be a voracious doodler in my childhood. The margins of the first books that I read, Mahabharata and Ramayana, were filled with my own depictions of the events. While at school (3rd/4th standard), we were told that if we accompanied our answers with pictorial representations, it would fetch us better marks. It tickled the artist in me and I would fill the pages with various food images to illustrate sources of vitamins. I wonder now if the teacher laughed softly or really hard looking at them. Combine all the ingredients together. Pour into moulds and freeze for around 3 hours or till the lollies become firm. Enjoy these chocolate ice lollies like we did then, swinging our feet from the branches of trees or by the side of the pond, without any care in the world. Or, just slurp away! Really? Now that I look at it, I feel like hiding in shame! And you guys have such amazing posts! Hey Sangeeta! This is so COOOOL!!! Very presentable neat Doodle & simple to make too! Thanks Abhyudaya! So glad you liked my doodle!